I’ve just returned to Williamsburg after a month of field research in Utah at Fish Lake and the High Plateaus. I journeyed to Utah with a team of four W&M undergraduates, nicknamed the Wayne WonderMonkeys (more on their name later). June brought copious rain to Williamsburg (more than 25 cm (10”) fell on campus), all the while we enjoyed a long run of sunny and dry weather in south-central Utah. 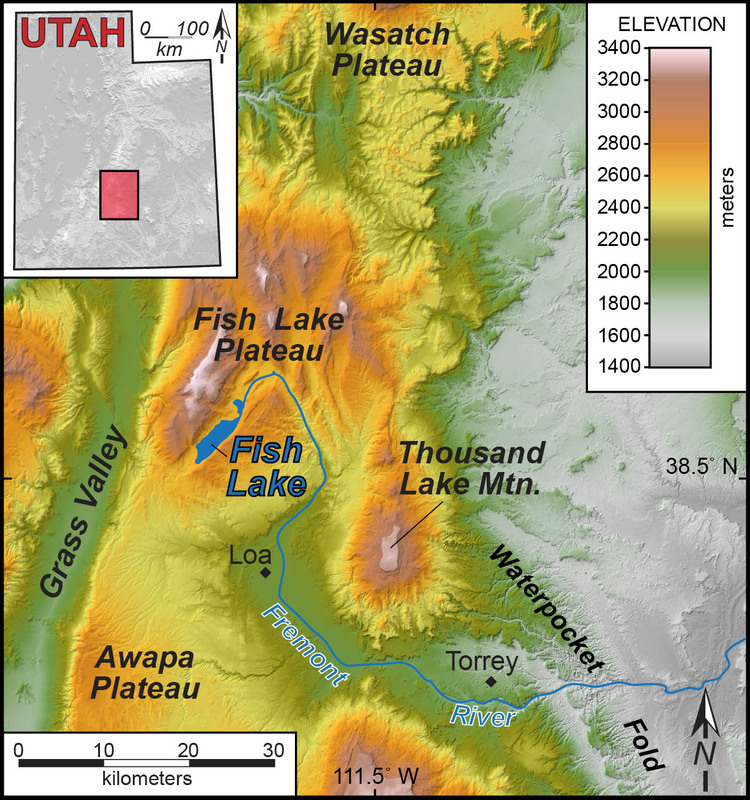 Shaded elevation map of south-central Utah, illustrating the location of Fish Lake and the High Plateaus region. Fish Lake is the largest alpine lake in Utah. It covers an area of ~10 square kilometers (~4 square miles) at an elevation of 2,688 m (8,843’). This lake formed in a graben, a structural trough created between two normal faults. Grabens develop in regions where the Earth’s crust is extended and stretched. 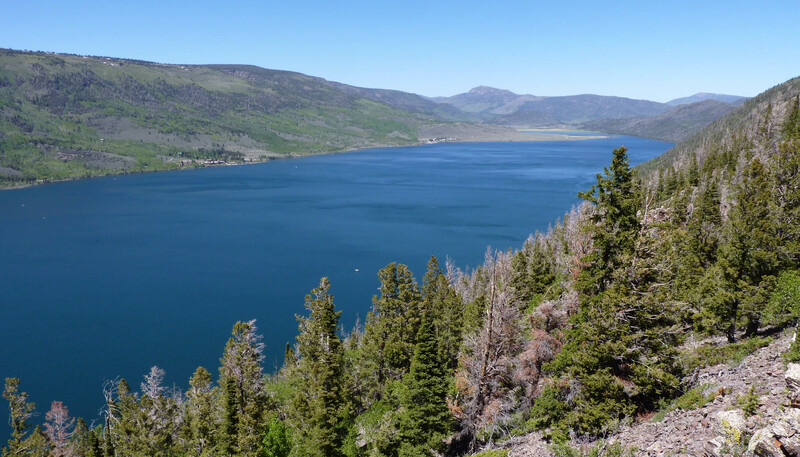 Our past research has documented the geological structure of the Fish Lake region and we’ve mapped the bathymetry and sediment distribution of the lake. Fish Lake’s bottom is covered by copious amounts of smelly organic-rich mud, a bit of sand, and even boulder deposits in places. But how much sediment lies at the bottom of Fish Lake: a few meters (~10’) or a few hundred meters (~1000’)? View to the north of Fish Lake from Mytoge Mtn. Interpretative geologic cross section of the Fish Lake graben. The green and purple units are volcanic rocks, the gray unit is pre-volcanic sedimentary rocks, yellow is sediment fill in the lake basin (note the question marks), and blue is water in Fish Lake. Erika Wenrich’s ’14 senior thesis project focuses on determining just how much sediment lies at the bottom of Fish Lake. One way to determine the sediment thickness at the bottom of the lake would be to drill a core out in the middle of the lake. Drilling a full core from a lake’s bottom is an expensive proposition (say, a million dollars or so). A far cheaper method uses gravity to estimate the sediment thickness. Gravity, or more precisely the acceleration due to gravity, is not the same at all locations on Earth. The acceleration due to the Earth’s gravity (denoted as g, spoken in casual conversation as ‘little g’) varies according to one’s latitude (greater at the poles, less at the equator), elevation (greater at sea level, less at altitude), the surrounding terrain, and due to the density variations in materials below the Earth’s surface (the denser the material, the greater the acceleration due to the Earth’s gravity). We use an instrument, intuitively named a gravimeter, to measure g at a point on the Earth’s surface. We measured gravity at 55 locations in the Fish Lake basin. 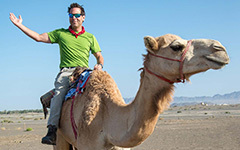 At each location we calculated what the theoretical gravity should be at that point (by taking into account the latitude, elevation, and terrain). The difference between the observed or measured gravity and the theoretical gravity at a point is the gravity anomaly. These anomalies provide insight about the subsurface materials and their geometry. The Wayne WonderMonkeys making a gravity and elevation measurement near Fish Lake. From left to right Zack Fleming (with the gravimeter), Erika Wenrich, Hanna Bartram (holding the kinematic GPS rover) and Peter Steele. Erika’s research plan involves 1) constructing a gravity anomaly map of the Fish Lake basin, and 2) making a 3D model of those gravity anomalies to estimate the thickness of sediment in the basin. 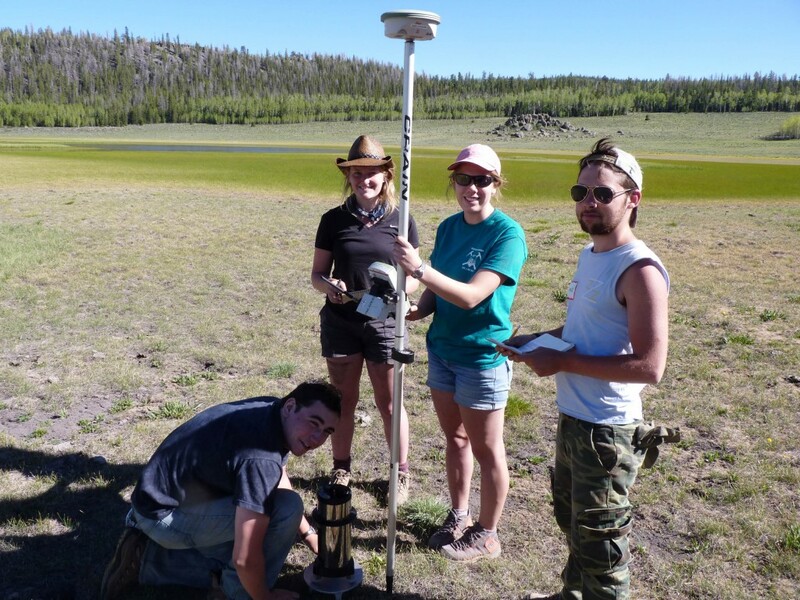 Our task this summer was to lay down a grid of gravity observations around Fish Lake. This winter, when Fish Lake is frozen over, we’ll go back and measure the gravity at sites on the lake itself. A common question we are asked is “Why do you want to know the sediment thickness in Fish Lake?” or put another way “Who cares how much sediment is in the lake?”. We are interested in the sediment at Fish Lake because it contains a record of tectonic activity as well as climate and environmental change over at least the last two ice ages (past 150,000 years), and perhaps much further back (~1 or 2 million years). Knowing the amount and geometry of the sediment package is a key step towards procuring funding to actually drill a lake core and learn the secrets buried beneath Fish Lake. Redux: Is it really that hard? Someone should core that puppy! I want in! I have no money though. Yes, we obtained a number of gravity measurements on the Pelican Canyon moraine and plan to use the same modeling techinque to estimate its thickness. We know from our previous work that there is a 2nd older moraine that is flooded at the NW edge of the lake.